The OHorizons Team (Tamara Minick-Scokalo, Natalie Relich, and I (Dylan Lunney)) had the pleasure of spending a week, at the start of May, visiting southwestern coastal Bangladesh, the site of OHorizons' largest BioSand Filter (BSF) project. Natalie had already been here in 2014 to conduct a Wood Mold training, but for Tamara and I, we found ourselves for the first time on the edge of the Sundarbans, the world's largest mangrove forest and home of the Royal Bengal Tiger, whose population is dwindling as competition for the resources of the Sundarban forest increases and its habitat is encroached upon. Over the course of the week we were inundated with stories of "tiger-widows," women whose husbands had been killed by tigers that had strayed from the forest, often in search of food. Ponds and shrimp farms, most of them man-made, dot the landscape. There is water everywhere, but it's either brackish (salt-water intruded) or biologically contaminated with pathogens. This harsh reality has created a dire drinking water situation for the low-income families that live in this area. We decided to put together a picture essay to share the sights and emotions of this wonderful place and to tell the story of how a local non-governmental organization named LEDARS, in partnership with OHorizons, is now overseeing one of the largest BioSand Filter projects in the world. Quite simply, the visit was an amazing experience and a special reminder of the impact behind our mission. One option for safe drinking water access in this region are community slow sand filters (pictured above). They function similarly to how our BioSand Filters do, but on a community versus household scale. These community filters also have the additional drawbacks of long lines, cloudier water than our BSFs, and the potential for recontamination of the water between the access point and point of use. We talked with the women pictured here and they told us that waiting for water at this station can exceed multiple hours per day. It wasn't hard to find people upset with their drinking water situation. We met GM Abdul Wazed (pictured above) one afternoon when we decided to explore some of the surrounding villages to get our own unique sense of the water situation. Abdul explained to us that his house is located in close proximity to the community water point behind him. Disappointingly, the water point hadn't worked for the past 3 months. He shared with us that now in order to get water, he has to make an hour long trip everyday to the next closest community slow sand filter and that he sees women come to this location daily looking for water. You might not be able to tell from this picture, but he was an extremely friendly guy. His story and frustration put us all in a somber mood. We saw similarly heartbreaking situations as we traveled to different districts in Bangladesh. The story always went something like this...A community water point had been installed by a well-intentioned foreign NGO, but after a year (or sometimes months), it had broken down with no one in the community trained to fix it. Now, families who once had easy, reliable access to clean water, have to go without or travel even further to find safe water to drink. To check-in on our BSF beneficiaries, we made unannounced appearances at randomly selected homes across multiple villages. Everyone we visited told us they use their household water filter daily and are very happy with the water quality. Tapoti Rani Mondol (pictured above) welcomed us into her home and shared how impactful this filter has been for her and her family. Tapoti's story will be featured in one of our beneficiary video testimonials that will be released later this summer. Our Implementation Partner organization, LEDARS, has hired 17 local employees to work full-time on this project! Over the course of the week, we got to see them in action and personally got to know many of them. 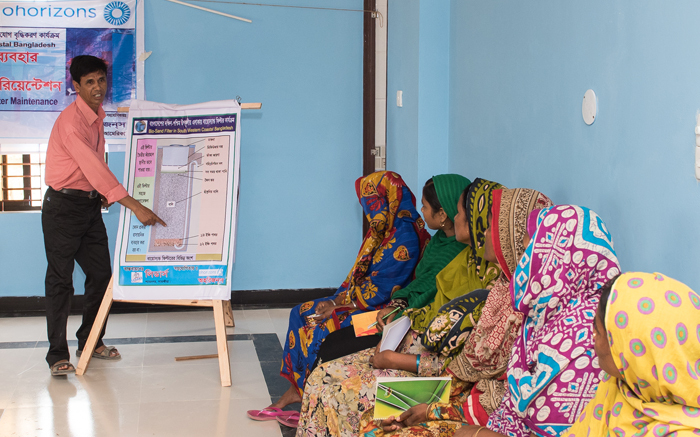 We feel highly confident in their ability to scale this project and serve as positive change-makers for the people of southwestern coastal Bangladesh. Executive BSF Project Manager Ranajit Kumar Mondal sits down with a filter owner to ask her some survey questions, which he then plugs into the mWater App on his cell phone. Each of our water filters is geo-tagged and has extensive user and performance data tracking associated with it. OHorizons' Natalie Relich is pictured here leading the BioSand Filter Technician Team on how to operate their new Aquagenx Water Quality Testing Kits. The data from these kits also plugs into the mWater App, centralizing all of our data in real time. Training beneficiaries on how to properly use and maintain their filters is essential to the success of our work. We require that at least one representative from every family receiving a filter participate in our user training workshop. 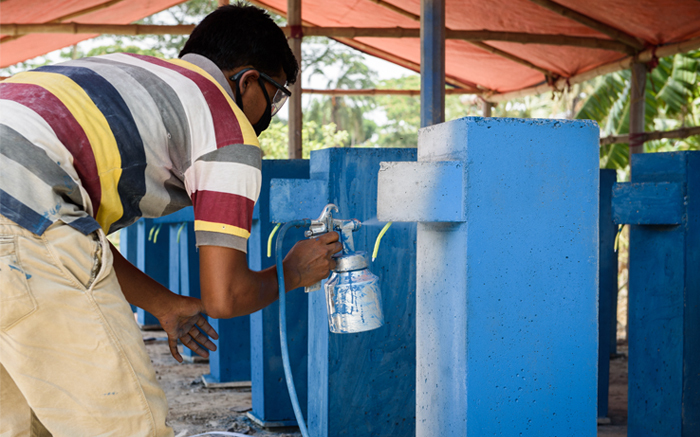 A local employee paints 1 of the 3,000 OHorizons' BioSand Filters that will end up in Bangladeshi families homes in 2017 alone. That's safe and easy water access for 15,000 people! Taslima, one of the BSF Technicians, holds up the OHorizons' Wood Mold Construction Manual at our Wood Mold/BioSand Filter Production Center in Shyamnagar. The BSF Technicians are responsible for installing filters into beneficiaries' homes, conducting surveys and water quality testing, and following up with users over time to make sure the BSF is being used properly and continues to provide families with clean water for years to come. Access to sustainable safe drinking water is an essential building block for a thriving community. Please share this story so we can help empower more communities around the word to solve their own drinking water problems (as LEDARS is doing).